I happily take a break today from the Lancaster County Regiment to republish the letters of Adam C. Reinoehl to the Lancaster Daily Evening Express during his service with the 76th Pennsylvania. Welcome to any readers visiting this blog through Prof. Louise Stevenson's Civil War class at Franklin and Marshall College, the institution from which Reinoehl graduated as the valedictorian of the Class of 1861. 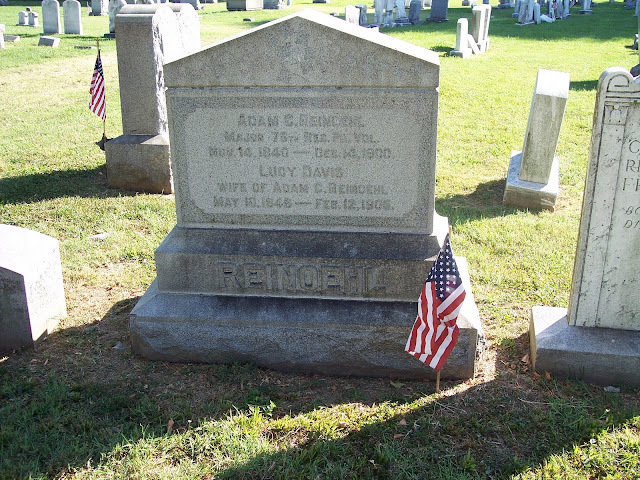 As not only one of the most prolific of Lancaster's many Civil War soldier-correspondents, Adam C. Reinoehl also had some of the more unique experiences in his service with the 76th Pennsylvania Volunteer Infantry (the "Keystone Zouaves") between 1861 and 1865. The regiment spent most of the war around Hilton Head, South Carolina, where Union forces encountered issues of slavery, emancipation, and African-American soldiers in very raw form. The 76th Pennsylvania was even brigaded with the 54th Massachusetts in the famous July 1863 attacks on Fort Wagner, in which Reinoehl was wounded for the first time and which are chronicled in the movie Glory. After the war, Reinoehl carried on Thaddeus Stevens-style Radical Republicanism as a member of the Pennsylvania Legislature for three-terms. He also remained one of Lancaster's most active Civil War veterans, helping to lead efforts to erect the Soldiers and Sailors Monument, working on soldiers' orphans issues, and organizing Grand Army of the Republic posts in Lancaster County. By my count , Reinoehl penned twenty-nine letters to the Daily Evening Express, usually spaced in one-month intervals. He wrote under a pen name, which I'm guessing was more to provide a literary flair than preserve anonymity, as the letters' author's identity would have been pretty obvious in Lancaster (although perhaps it provided a buffer against a negative reaction by someone in the War Department). Reinoehl curiously signed his letters, "Demas," presumably alluding to the Apostle Paul's companion in mission who later deserted Paul "because he loved this world" (2 Timothy 4:10) and is held up for as an example not to emulate for Christians. I wonder if Reinoehl chose the name as a playful way of recognizing how he--the valedictorian of Franklin and Marshall College's Class of 1861--got caught up in the spirit of the times and enlist in the army to abandon the higher calling of academic life. Brevet Major Adam Cyrus Reinoehl was born in Lebanon, Pennsylvania, November 15, 1840. In 1856 his parents settled in Lancaster, Pennsylvania. Entering Franklin and Marshall College at Lancaster, he graduated in 1861, receiving the valedictory oration,the highest honor of the class. On commencement day, on taking formal leave of the Board of Trustees, he commented on the action of that body at their meeting held on the previous night, when they dismissed from the faculty Professor Koeppen, a learned, faithful, but somewhat eccentric gentleman, greatly beloved by the students. The president of the college arose and ordered him to stop, but, disregarding the interruption, the valedictorian continued. The president called on the band to play, but the orator proceeded until his voice was lost in the music. The exercises were abruptly ended. The public insisted that the valedictory should be delivered, and the owners of the hall refusing to hire it, in the evening Charles Eden tendered the balcony of his ice-cream saloon, adjoining Fulton Hall, from which the oration was delivered in the presence of several thousand ladies and gentlemen, who crowded the streets in the vicinity. 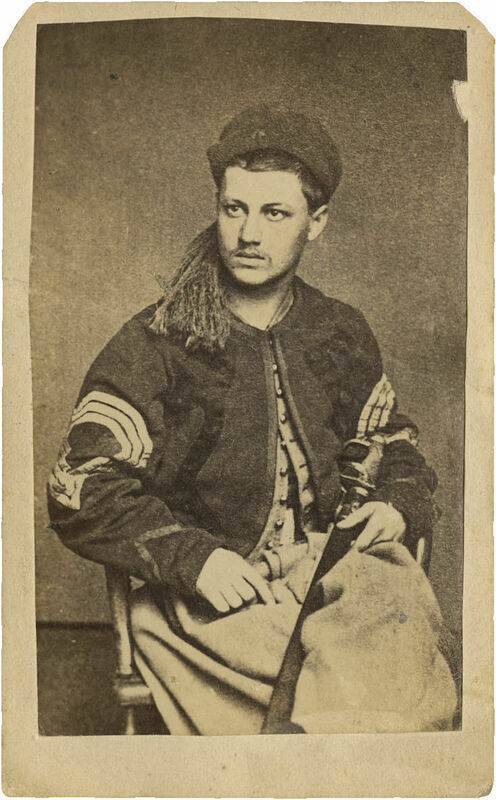 After teaching school for two months and twenty-three days in Ephrata Township, he enlisted in the Seventy-sixth Regiment Pennsylvania Volunteers, Keystone Zouaves. Entering the service as a private in Company D, he took part in all the campaigns and battles of the regiment. The Seventy-sixth was ordered to Port Royal, South Carolina, in the fall of 1861, and was actively engaged in the sieges and engagements in the Department of the South. In April, 1862, the regiment was ordered to Tybee Island, and was present at the siege and capture of Fort Pulaski. Reinoehl served as private of Company D in the campaign against Charleston on James Island, June, 1862, and in the battle of Pocotaligo, South Carolina, October 22, 1862. On the 10th of December, 1862, he was promoted to regimental quartermaster-sergeant, and January 24, 1863, he was promoted to sergeant-major. The Seventy-sixth was in Strong's brigade, which charged and captured the rebel batteries on Morris Island, South Carolina, July 10. On the morning of July 11, 1863, the Seventy-sixth Pennsylvania, with four companies of the Seventh Connecticut and Ninth Maine, charged Fort Wagner, and were repulsed. The Seventy-sixth lost one hundred and eighty-seven killed, wounded, and missing. Sergeant-Major Reinoehl was shot through the left arm with a Minnie-ball, and was permanently disabled. Returning to his regiment after a furlough, he remained in the service, and re-enlisted April, 1864, for three years, and while on veteran furlough, having been recommended for promotion by Colonel Strawbridge, received from the hands of Governor A. G. Curtin, at Harrisburg, a commission as first lieutenant of Company B, April 27, 1864. He commanded the company during the campaign of the Tenth Corps, in the Army of the James and Army of the Potomac, at Cold Harbor, at the explosion of the mine, and in the siege of Petersburg. On the 4th of August, 1864, he was promoted to adjutant. On the 27th of October, in a charge on the rebel works at Darbytown Road, Va., the outer defenses of Richmond, he was severely wounded in the left thigh by a ball from a shrapnel shell, and was removed to his home at Lancaster. Disabled for months, he resigned, and was honorably discharged Feb. 6, 1865. March 13, 1865, he was brevetted captain " for gallant and meritorious service in the assault on Fort Wagner, S. C.," and was brevetted major "for gallant and meritorious service in the attack on the enemy's works on Darbytown Road, Va., Oct. 27, 1864." In 1866 he was admitted to the bar of Lancaster County. In 1868 he was elected to the Pennsylvania Legislature, and subsequently re-elected in 1870 and 1871, serving three terms. In 1872 he was appointed Deputy Secretary of the Commonwealth by Gov. John W. Geary, and was continued by Gov. John F. Hartranft, until he resigned, in 1873, to resume the practice of his profession. On retiring he was tendered letters highly complimentary of his services by Gov. Hartranft and Hon. M. S. Quay, Secretary of the Commonwealth. In 1889 he was appointed a member of the Soldiers' Orphans' Commission of the State of Pennsylvania by the department commander of the Grand Army of the Republic. In 1889 Major Reinoehl was elected district attorney of the county of Lancaster, his term expiring Jan. 1, 1893. He married Miss Lucy Davis, Nov. 24, 1870. They have four children,-Walter Allan, Mary Acheson, Gertrude Laughlin, and Albert Riegel. He is an active member of the Grand Army of the Republic, and of the Pennsylvania Commandery of the Military Order of the Loyal Legion. Reinoehl died on December 14, 1900, in an incident described as suicide in a New York Times account. Another biography is available here. I have compiled Reinoehl's letters (except the May-October 1862 letters ) as a pdf available to view and download at this link <https://docs.google.com/open?id=0B5luPkqpDDWkZTViNWQzNTctZjY4NC00Zjg3LTk0ZTktN2RmYjBjZDFhZTBl>. Search "Reinoehl" in the digitized Lancaster Intelligencer, a staunch conservative Democratic newspaper which had many colorful things to say about the Republican Reinoehl. Find the letters from "Demas" written to the New Era in the 1880s(?) as part of the Tucquan Club, a fraternal organization for prominent Lancaster men that went camping along the Susquehanna River. Find Reinoehl's account of the Battle of Fort Wagner appearing in the March 31, 1886, Philadelphia Weekly Press. This also appeared in the April 10, 1886, New Era (I have a paper copy, but not an electronic copy). Regimental history and roster of the 76th Pennsylvania. 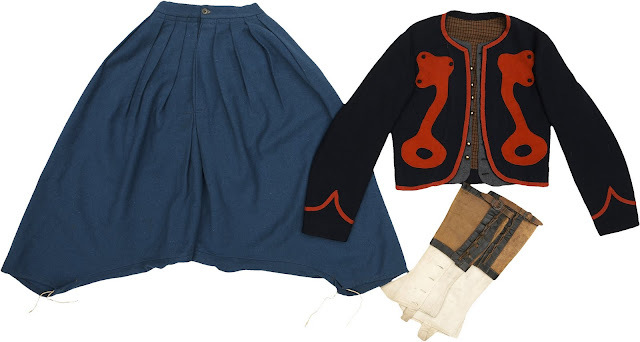 Illustration of 76th Pennsylvania zouave uniform in Don Troiani's Civil War. Learn about Lieut. W. Wilberforce Nevin, valedictorian of F&M's Class of 1853 and son of future F&M president. I recently stumbled upon this image sold by Heritage Auctions a couple years ago. 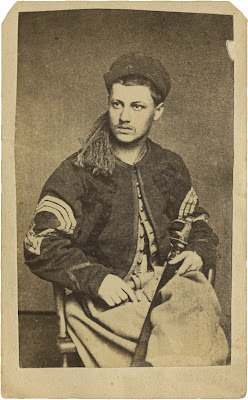 It is a mid-war image of a sergeant major of the Keystone Zouaves taken in Lancaster by Jamison and Benson photographic gallery in Lancaster. Given that there's only one sergeant major in the 76th Pennsylvania (which was Reinoehl after he was wounded at Fort Wagner and subsequently returned home) and that none of the 76th PA companies were recruited in Lancaster, this image almost certainly has to be Reinoehl. Thanks to Richard Sauers' index in the PA Save the Flags Collection at USAMHI for expediting the process by which I found these letters. The May-October 1862 editions of the Daily Evening Express are not microfilmed but available as part of newspaper bound volumes at the Lancaster County Historical Society. I do have pictures of those letters, but they need some processing (maybe transcription) before I can post them.